Offering you a complete choice of products which include professional portable eng receiver. We are proclaimed as prominent exporter and supplier of Professional Portable ENG Receiver. These portable receivers are known in the market for their excellent functionality and optimal weight due to their procurement from trusted vendors. Our vendors manufacture these receivers by utilizing high-end technology and quality tested raw materials as per current industrial trends. Furthermore, we make supply of these products in tamper proof packaging at nominal price tags. 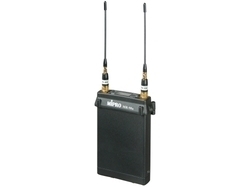 The MIPRO MR-90a is designed to install in the wireless receiver slots found on professional video cameras. With optional accessories, the MR-90a can be configured five different ways to fit all types of camcorders such as the Sony Betacam series or Ikegami and other compatible camcorders. The MR-90a compact, miniature receiver utilises the UHF band, PLL synthesized technology and dual-antenna true diversity design, ensuring clear and stable signal reception with no signal dropout even in the most unpredictable operating environments. It has a wide frequency range where 100 selectable frequencies are pre-programmed. With the world's first ACT programming function of MIPRO's ACT Series, the receiver and transmitter can set up a clear working frequency rapidly and automatically. A weather-resistant metal case provides professional strength and durability. A standard LCD panel gives a clear and accurate display of all digital operations and setup. The MR90a can also be installed on an active PA speaker via MA-909 wireless mixer, MT-90A wireless interlinking transmitter or ACT transmitters to turn active speakers into a wireless system.